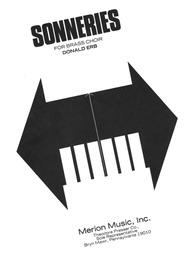 Sonneries (For Brass Choir - Score). Composed by Donald Erb. Brass ensemble. For Trumpet I, Trumpet II, Trumpet III, Trumpet IV, Horn I, Horn II, Horn III, Horn IV, Tenor I, Tenor II, Tuba. Full score (large). Standard notation. 29 pages. Published by Theodore Presser Company (PR.144400220).With Standard notation.